When I was a kid, some smartass relative snuck a woodburning kit into my birthday presents — a kit of low quality and high difficulty combined with my complete lack of patience was not to bode well. 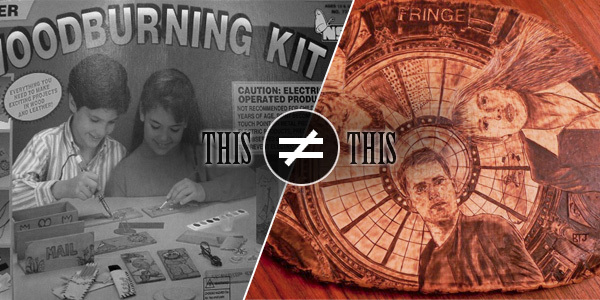 Many might remember the kit: it came with a ton of little wood pieces and some leather you could burn on (which never worked out for me), and there was a child grinning on the cover of the box like he’d just been to Disneyland or something. This was my memory of what I later learned is called pyrography. And few weeks ago, I discovered that particular set from when I was a kid was to woodburning what a model-T is to a modern-day automobile. The way those craft or hobby burners worked was a single, high-temperature heat that warmed up a thick copper tip. It was exasperating in the extreme because the iron got stuck in the wood and I couldn’t draw for crap as a child. The iron took 5 to 10 minutes to warm up and get hot, even longer to cool down, and in between was a lot of frustration. Plus the tip could weld itself to the screw threads and be a complete bear to remove, if you didn’t break it in the meantime. What no one told me when I was young is that pyrographic work combines many things I sucked at — patience, fine motor skills, forethought, and planning. Add to that the many layers of shading and the slow nature of the process itself (lifting and waiting for the pen to warm for a few seconds before continuing on), and you’ve got a recipe for discouragement. Unfortunately for me I always liked woodburning even though I was pretty horrible at it. 25 years, formal art training, and a ton of artistic projects later, I wanted to return to it and found an excellent website that broke it down like a fraction for me. The Sawdust Connection site, while perhaps a touch difficult to navigate at first, is a wealth of information on how to get what you what out of burning. The proprietor, Nedra Denison, is an experienced artist of some repute who has written out the pitfalls and traps that aspiring artists fall into when entering and learning the craft. She enlightened me to the world of variable temperature detail burners and how they work, the different fixed point pens available and what they might be used for, plus the concept of burning on anything you’d like instead of rounds — which I always despised. Case in point, Nedra says that there’s nothing really wrong with craft burners if you are looking to do mostly outline work in small doses. However, if, like me, you’re looking to get something more robust out of the process, then variable temp burners like the Razertip SK (that I eventually sprung $140 for) is the way to go. You can shade, outline, and damn near paint with the thing given the right pen hooked to it. She warned that claims of super high wattage models really don’t matter; all the pens can do is about 27 watts max and almost all variable temp transformers do that, so you might as well get the one that fits your needs and budget. I spent nearly three hours on the site learning what equipment, setup and iron/pens to pull the trigger on. She thoroughly goes over all the questions I was chewing on, plus about twenty more I hadn’t thought of. As an adult I found the process to be much more relaxing and highly challenging as I picked up a pen for the first time in over two decades and began to blacken lumber. On some junk wood, I free-handed two quick outline designs that interested me. They are not good yet, but I know now I’ll only get better with time. I learned more from reading Nedra’s site and practicing for an hour than the sum total of my many frustrating hours as a kid combined. Next I will shade and do some detail work to really put the gear through its paces. It’s clear I had no idea how much there was to learn about pyrography and the modern gear now involved. And for the first time in my life, I look forward to trying more. Just the other day there was a special report on the local news re: the PA State Farm Show in Harrisburg, and one of the exhibits they highlighted was the PA Gourd Society. Some of the carvings & etchings were very cool. I had seen some use of gourds as birdhouses/feeders, but never as a media for fine art. May need to look into this a bit more! Thanks for the kick start, Sean! 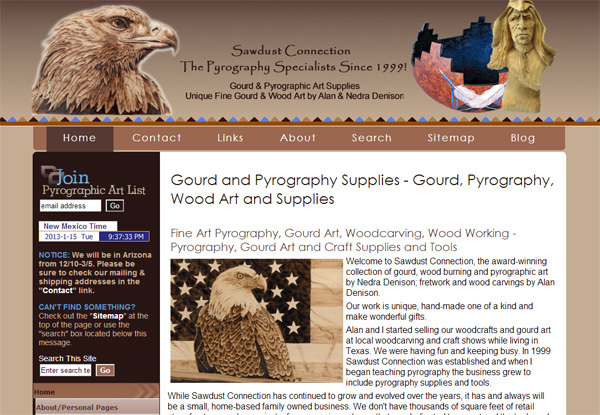 There’s no better person for giving advice about pyrography than Nedra Denison. I bought my Razertip from her years ago and haven’t looked back. Sorry to play the lazy card, but I can’t find good info on that site regarding using a good soldering iron for pyrography. I’ve got a Hakko FX-888 that does variable temperature and it is supposedly pretty good for temperature recovery. There are also a wide variety of tips that will fit it. What would be the big differences between something like a Razertip and good variable temp soldering iron? Hi Will – The main difference for me would be that I can hold a Razertip pen much closer to the point (just like using an ordinary pen). Any of the soldering iron types have to be held too far up the shaft to have good control of the point. 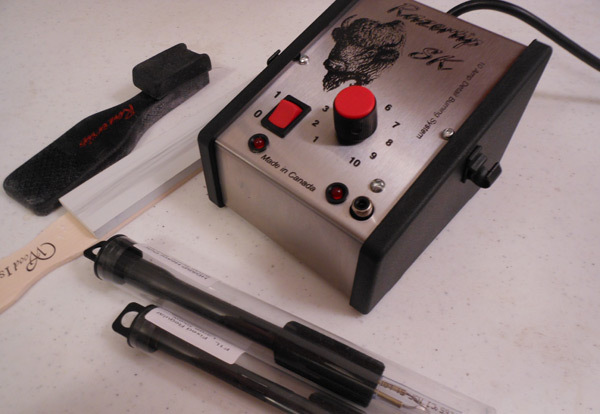 I started pyrography many years ago using a solid point similar to a soldering iron – there is no way I would ever go back to using one of those now. Thanks Lesley, that’s kind of the answer I was hoping for. It means I can get my feet wet with my Hakko iron and maybe move up if I like it. You’re welcome, Will. I must say that I admire anyone who can get anything halfway decent out of a soldering iron-type pen – and I do know of several excellent pyrographers who do – I certainly can’t. I’ll stick with my Razertip and my faithful old Davan wire-point. Articles–and replies–like these are yet another reason I love this site. Fast updates or slow seasons, I feel like there’s a present under the Christmas tree every time I see a new post. It’s the only site on the internet where I intentionally click articles I may not actually be interested in (which is rare) just so I can read the comments. Sean, I am truly flattered & so glad you are enjoying Pyrography. My goal has always been to provide people with as much information as possible to learn the art of pyrography & most important is to learn about safety when burning. My website was totally redesigned last year. Working with a web designer we spent 6 months working on it together to make it user friendly & easier to navigate. One of the problems is that there is so much information that it can be overwhelming. If you use the search box or the site map it can make it easier to find things. The Pyrography 101 tutorial is something that new burners should read before they jump into this wonderful hobby. The tutorials are continually updated as I discover things that should be added. Unlike my books the website can be updated quickly to keep people informed. I’m thrilled to say the least, that Sean has honored me with his posting here & for Leslie’s testimonial.